Here are just a few of the many San Francisco Bay Area post weight loss patients Dr. McNemar has had the honor to help in recent years. What are you waiting for? With Dr. McNemar's experience, support, and skill, you can start telling your own success story and close the book on being overweight. When Cindy met Dr. McNemar, she felt a bond right away. "I felt very comfortable with him," she says. "Now I rock climb, hike and run half marathons. I never did any of that before!" Debbie is proof positive that change is good. "Dr. McNemar always took his time with me, I never felt rushed," she says. And now that she's enjoying her her trim and toned figure? "I found the real me!" 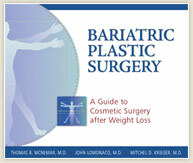 Considering cosmetic improvement after obesity surgery in San Francisco or Northern California? Join Dr. McNemar's patients who have achieved their cosmetic goals and changed their lives for the better when you request a consultation at his practice in San Ramon or Tracy, California. Dr. Thomas McNemar is a board-certified plastic surgeon helping San Francisco weight loss surgery through post bariatric plastic surgery procedures. He has offices in both San Ramon and Tracy and serves patients from all over the Bay Area including San Francisco, San Jose, Walnut Creek, Stockton and Oakland.